Don’t say summer’s over, cuz we’ve got your Sunscreen right here. The latest addition to Big Cartel’s lineup of free, built-in themes is here. It’s full of so many customization options that we’re pretty sure it’s SPF 💯. Sunscreen shines with easy navigation and flexible ways of showcasing products. If you’ve ever struggled over which image to use as your primary product photo, Sunscreen solves that. With this theme, your second product photo shows when shoppers hover over the item in your product list. Take the opportunity to show two views of your product: flat and on a model, in packaging and alone, front and back - you get the idea. This gives customers a more complete look at your items, and makes the product list a lot more fun to browse. It’s like getting your hot dog and eating an ice cream cone too. Shops of all sizes look great on Sunscreen - you can maximize the space on each row with up to four products on desktop or two products on mobile, or you can give each product the spotlight by showing as few as one product per row. If you’re currently focusing on a few core products, spreading them out over more rows works well. For shops with a more expansive line, make the most of the time someone spends on your site while showing them more at once. And for those folks who like even more control, you can also decide how many products show per page. You’re not in the kiddie pool anymore. With the announcement message at the top of every page of your shop, you have a place to announce discount codes or shipping delays. This bar appears at the top of your site, giving visibility to important announcements without disrupting the overall look of your store. 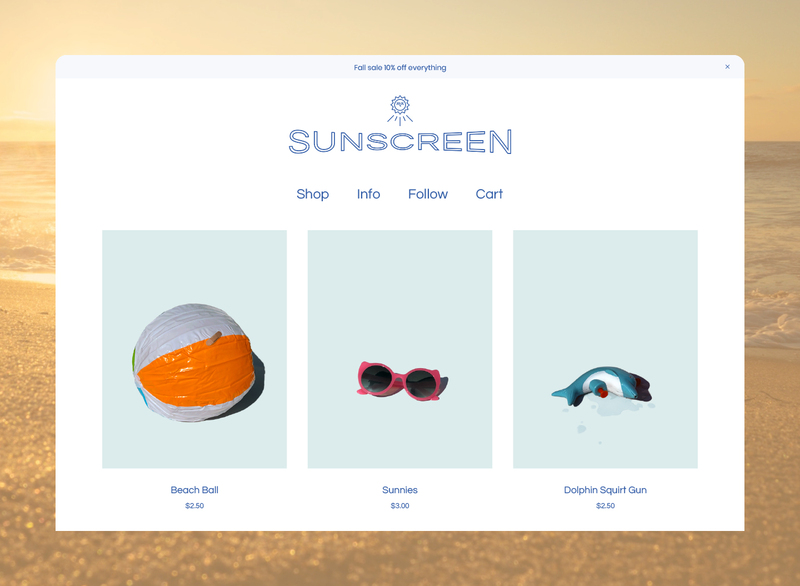 Check out the theme’s demo store, then log in to your shop admin to slather on the Sunscreen. It’ll have your shop shining so bright, we’ll need shades. Learn more about Sunscreen and other free Big Cartel themes on our Themes page.